WASHINGTON, April 4, 2011 — U.S. and Philip­pine forces will kick off Balikatan, their annu­al bilat­er­al train­ing exer­cise, tomor­row in the Philip­pines, though in a slight­ly scaled-down form. The 10-day exer­cise will pro­ceed “despite a reduc­tion in the num­ber of par­tic­i­pat­ing U.S. troops, many of whom are in Japan to assist in relief efforts there in the wake of the recent earth­quake and tsuna­mi,” offi­cials at the U.S. Embassy in Mani­la announced today. Sol­diers from the 643rd Engi­neer Com­pa­ny, 84th Engi­neer Bat­tal­ion, 130th Engi­neer Brigade, 8th The­ater Sus­tain­ment Com­mand, con­struct an addi­tion­al class­room at Angel C. Man­glic­mot Memo­r­i­al Ele­men­tary School in Zam­bales province, Philip­pines, March 14, 2011. 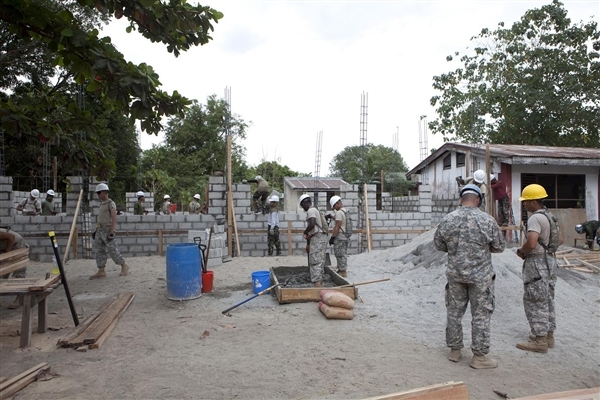 About 6,500 U.S. ser­vice mem­bers will join their Philip­pine armed forces coun­ter­parts to con­duct com­bined staff exer­cis­es, field train­ing and human­i­tar­i­an assis­tance projects to improve inter­op­er­abil­i­ty, con­tin­gency plan­ning, and their capa­bil­i­ty to respond to nat­ur­al dis­as­ters and oth­er crises, U.S. Army Pacif­ic offi­cials said. The 8th U.S. Army, with head­quar­ters at Yongsan Gar­ri­son in South Korea, announced it would deploy about 500 sol­diers from the 2nd Infantry Division’s 4th Squadron, 7th Cav­al­ry Reg­i­ment, to aug­ment 6,000 U.S. forces already slat­ed to par­tic­i­pate. The goal, offi­cials said, is to increase the two mil­i­taries’ abil­i­ty to respond quick­ly and work togeth­er effec­tive­ly to pro­vide relief and assis­tance in the event of nat­ur­al dis­as­ters and oth­er crises that threat­en pub­lic safe­ty and health. U.S. Ambas­sador to the Philip­pines Har­ry K. Thomas Jr. called the bilat­er­al train­ing vital to both armed forces’ readi­ness capa­bil­i­ties. This year’s exer­cise, the 27th in the series, will fea­ture four events, offi­cials said. The first, which began before the offi­cial exer­cise start date, involves a series of human­i­tar­i­an and civic assis­tance ini­tia­tives, includ­ing med­ical, den­tal, vet­eri­nary and engi­neer­ing projects through­out the coun­try. Also planned is a sce­nario-based com­mand-post exer­cise that prac­tices joint and com­bined force plan­ning at the head­quar­ters lev­el, and field train­ing exer­cis­es that pro­mote cross-train­ing and increase inter­op­er­abil­i­ty. In addi­tion, U.S. and Philip­pine explo­sive dis­pos­al teams will con­duct com­bined-forces train­ing. The term “Balikatan,” a Taga­log word that means “shoul­der to shoul­der,” sym­bol­izes the part­ner­ship between the two coun­tries as they work togeth­er toward a com­mon goal. The annu­al Balikatan exer­cise is con­duct­ed under the aus­pices of the Mutu­al Defense Treaty of 1951 and Vis­it­ing Forces Agree­ment, with U.S. Army Pacif­ic serv­ing as exec­u­tive agent.